God is present at all times. As little ones wake up, go to school, play games, do chores, and more, God is always with them. 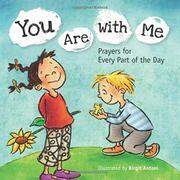 This board book provides reassurance that the Lord is always watching over his children, and all it takes is a quick prayer to open one’s heart to Him. The prayer snippets promised by the subtitle are all appropriate quotes from the book of Psalms and should be easy enough for little ones to memorize. As two white children set out for school, for instance, the accompanying prayer is “Keep me safe, O God, for in you I take refuge” (Psalms 16:1). Companion title Good Night: A Toddler’s Bedtime Prayer, by Emmanuelle Rémond-Dalyac and illustrated by Nathalie Dieterlé, is concurrently published but features an original prayer rather than one from the Bible that helps children reflect on their day and look for God’s hand in it. The illustrations in both are serviceable, featuring happy children and smiling parents—the heavy preponderance of them white—colored with muted blues, greens, and yellows.